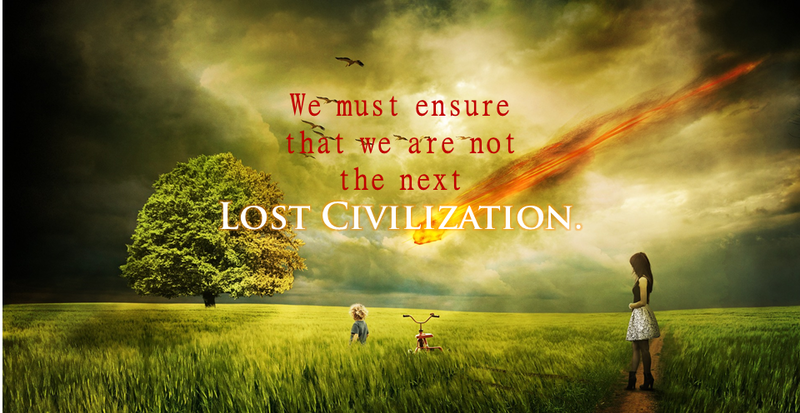 What causes an entire civilization to simply vanish without a trace? Natural disaster? Famine? Sickness? Maybe all of the above, and maybe none of the above. In the course of our known history, numerous civilizations have simply gone extinct. Sometimes, we can figure out what happened. Other times, we have absolutely no clue. Throughout history, we’ve seen time and time again, how a seemingly unconquerable civilization can be brought to its knees by disease, famine, or some other unknown cause. A nation could rule its part of the world one day, but a thousand years later, we don’t even remember their name – or whether or not they ever existed at all. Should such a calamity befall the human race as we know it, what would be left to prove our existence – a thousand years from now? Here are a few mysterious disappearances of thriving pre-Columbian civilizations that yet remain unsolved. Chichen Itza, probably the most famous Maya City consists of much more than just the El Castillo Pyramid. The city is a complex network of buildings, which are now mostly shrouded beneath thick jungles. Source. The Maya were a Mesoamerican civilization that established an empire in Central America, from Mexico to Honduras. The Ancient Maya had the most advanced writing system of all pre-Columbian peoples, as well as extensive knowledge in architecture, mathematics and astronomy. 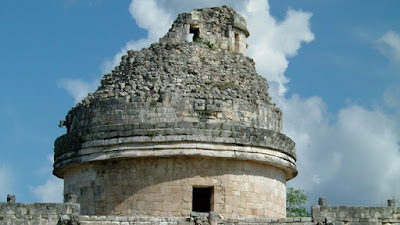 Ancient Maya Observatory shows the Maya’s keen interest in the stars. Source. The Ancient Maya Civilization is probably best known for its immense step-pyramids, which can be found scattered across the jungles of Central America. 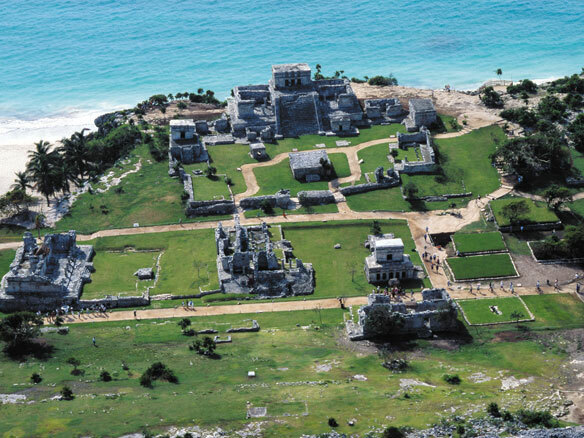 These were once the centers of complex cities, which comprised of temples, palaces, and even ball courts. The Great Ball Court at Chichen Itza. Source. The Maya reached the peak of their power around 600 A.D. By 900 A.D., most of their great stone cities were left mysteriously abandoned. Following the sudden exodus from the Classic Period cities, disease and warfare continued the slow extinction process. 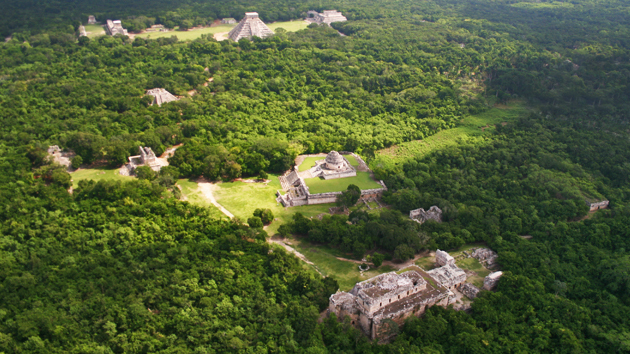 The final Maya capital fell with the arrival of the Spanish in the 1500s. Ruins of Tulum, a coastal Maya city. Source. Cahokia is probably one of the least-known ancient archaeological sites. 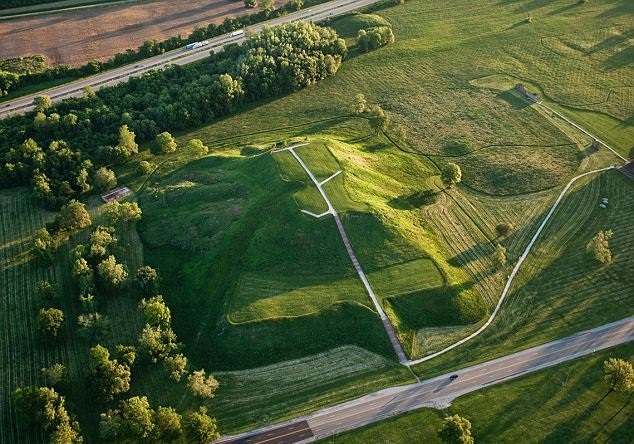 Located in modern day Illinois, the massive site was once an Ancient city. 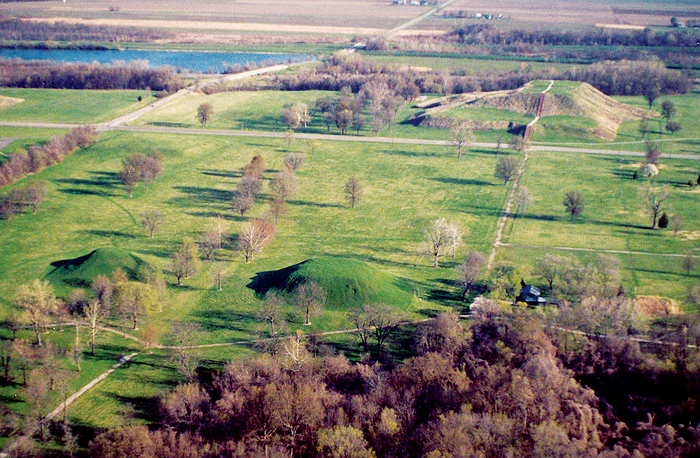 The site contains 80 earthwork “mounds,” the largest of which is called Monks Mound. 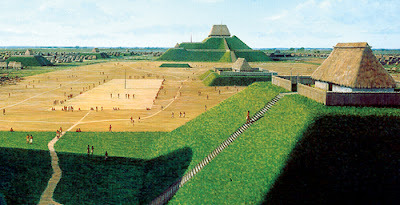 Monks Mound stands 30 meters high and 291 meters long. Unlike the Great Pyramids of Giza, or Gunung Padang in Indonesia, the mounds are not built with bricks. Instead they were created through the laborious task of layering coat upon coat of baskets of soil and clay. I know this sounds a bit like a giant sand castle, (it does to me. I was very unimpressed when I first heard about it.) In reality, the construction of Monks Mound was a feat of incredible engineering, without which, the mound would have eroded and washed away long before it could ever stand at all. The massive earthwork monument consists of 22 million cubic feet of clay, layered bit by bit with hand-carried woven baskets over a span of over 100 years. It was finally completed in 1100 A.D. Some argue that the mound may have been built in as few as 20 years. Either way, it’s not too bad for something that would stand for the next thousand years to come. Artist's depiction of Cahokia at its prime. Source. At its peak in the 13th century, Ancient Cahokia was home to a population of about 40,000. This number would not be rivaled in the United States until the 18th century, with the city of Philadelphia. During the 13th century, the Cahokia population began to decline rapidly until the city was finally abandoned in the mid-1300s. Proposed theories for Cahokia’s decline include floods disease and war. 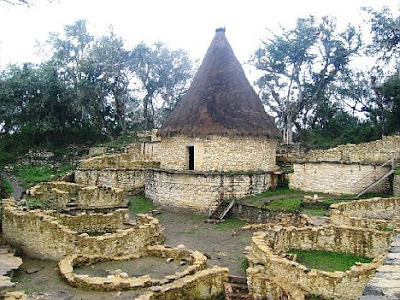 What really happened to these mysterious mound builders remains unknown. Well, it's just a pretty awesome picture, isn't it? Source. During the expedition, Orellana and his men were said to have been ambushed and attacked by tall, white, female warriors. Interestingly, this is far from the only account of ‘white people’ in the pre-Columbian Americas. Orellana named this female tribe the “Amazons” after the Amazons in Greek Mythology. The River later took its name after them as well. Carvajal and Orellana’s stories were long regarded as tall tales, created by adventurously-minded explorers who had sailed the length of the Amazon River, and needed something to show for it. There were two primary reasons to believe these stories were false. 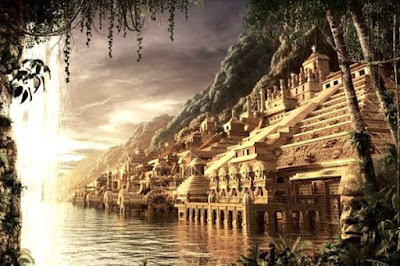 Later expeditions to the region never came across any evidence of such large cities. Further scientific studies in the area showed that the soil of the area was not fertile, and therefore ill-equipped to support the agricultural needs of a thriving population. Both of these reasons do not hold true today. Over the last few decades, scientists have discovered what they call “terra preta” or “Amazonian Dark Earth” in the Amazon Basin. This man-made soil contains a high charcoal content which can absorb and retain nutrients, keeping soil fertile for hundreds of years. Terra Preta soils were created by humans between 450 and 950 B.C., proving that humans did indeed farm in the Amazon Basin – a feat that was previously thought impossible. 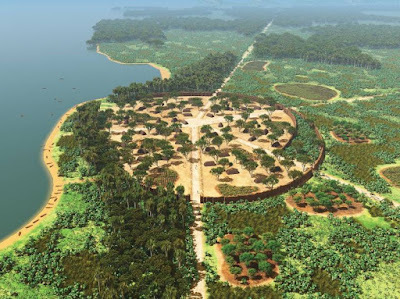 With the help of modern technology and satellite imagery, we are also consistently discovering more and more evidence of a highly populated Ancient Amazonian society. Aerial pictures of enormous ancient earthworks span a distance of over 150 miles. 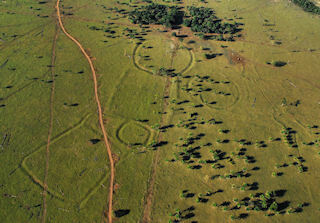 Ancient Amazon earthworks east of the Andes stretch for 155 miles. Source. Anthropologists have also discovered remnants of dozens of densely packed towns and villages, and a highly ordered society. Researchers believe there are likely thousands more like this buried deep in the thick Amazonian jungles. The recently discovered Archaeological site of Kuhikugu is a complex network of over 20 cities, spanning 7,700 square miles. It is located near the Zingu River in the Amazon Rain Forest. Source. Chachapoyas village, Ancient Amazonian settlement. Source. The question now is, what happened to them? 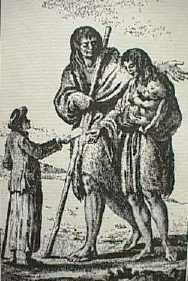 Several explorers to the Americas have given documented encounters with giants of 9 – 12 feet tall. In 1520, according to an account by Ferdinand Magellan while exploring the coast of South America, "One day we suddenly saw a naked man of giant stature on the shore of the port, dancing, singing, and throwing dust on his head. The captain-general [i.e., Magellan] sent one of our men to the giant so that he might perform the same actions as a sign of peace. Having done that, the man led the giant to an islet where the captain-general was waiting. When the giant was in the captain-general's and our presence he marveled greatly, and made signs with one finger raised upward, believing that we had come from the sky. He was so tall that we reached only to his waist, and he was well proportioned..."
Sailor offers bread to giantess & her baby. Nearly 60 years later, Sir Francis Drake is said to have reported encountering red-haired giants of 8 – 9 feet in height. In 1615, while sailing the Straits of Magellan in South America, explorer Jacob Le Maire discovered human skeletons of 11 feet in length. 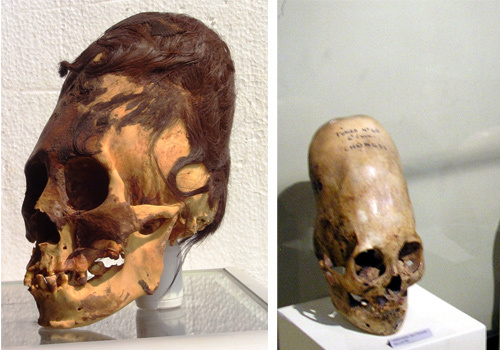 The Paracas Skulls are large, elongated, red-hair skulls that were unearthed in Peru. I’ll skip over the theories of these skulls not being human, and stick to the facts. They are giant, they have red hair. Unlike other elongated skulls, which were created through skull-binding and cranial deformation, the Paracas Skulls differ from regular human skulls in volume, weight and structure. (Cranial deformation will not alter any of these.) This suggests that they may be an unknown species of hominid. The famed Paracas Skulls. Source. So, those were several different stories from the America’s, with a certain recurring theme. ‘Evidence’ exists in the form of the skeletons, and the stories, if they may be considered as such. But, who they were, where they came from, or where they went remains a mystery.